Home > Blog > Barbie's garden > Hot summer day! I had to share this photo with you!! This was that really, really hot day last week when the chickens were so hot and the pool was so inviting. So, my family were in the pool that day! Now we can see that chickens do swim! It’s a classic crowd pleaser when we have the family over!! Hannes taught them all how to swim. I guess all animals can if they have lessons, heehee! Our chickens figured out early that if they stop flapping and going crazy, they can actually float and paddle around the pool. Now, they are used to it and enjoy the cool off! I almost thought they were rubber…so funny to learn they can swim…and so cute!!! This is so cute. I never saw a chicken in water before. You have to write to Curbstone Valley Farm so she gets to see your chickens. Thanks Donna – will do!! This isn’t a trick, is it? It’s incredible! 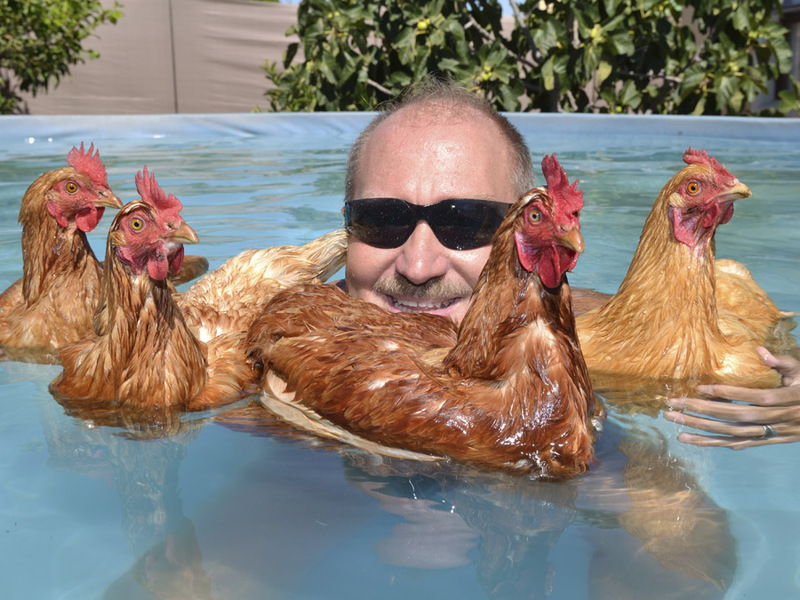 I’ve never seen or read anything about chickens in water. They look so duckish! I suppose next you’ll be telling me ducks lay eggs! Oh my – that’s sooo cute!! 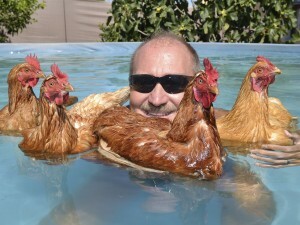 Hehe, tell Hannes he will be famous now as the “Guy that swims with chickens”!!! I never knew they could – learnt something new today!